Areas of light snow will mix with rain today, with minor accumulations possible. However with temperatures remaining above freezing, any accumulation of snow is expected to melt rather quickly. 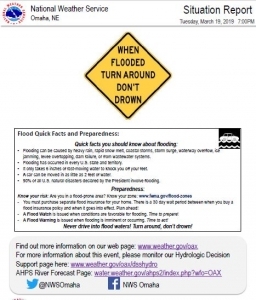 Total rainfall, including melted snow, is forecast to approach a half inch in southeast Nebraska south of Interstate 80, with about a tenth of an inch north of Highway 30 and the Platte River. Widespread flooding along rivers and streams will continue through tonight across most of eastern Nebraska and southwest Iowa. 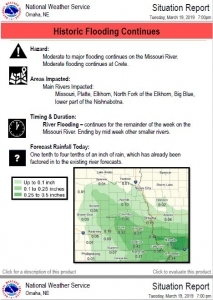 The main rivers that are flooding include the Missouri River, the Platte River, Elkhorn River, the Big Blue River and the lower Nishnabotna River. 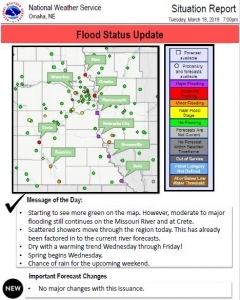 Wednesday through Monday moderate to major flooding will continue in much of eastern Nebraska and southwest Iowa. 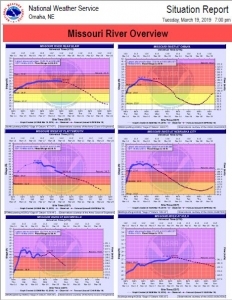 Flooding along the Missouri River is expected all week. Another storm system moving into the region this weekend is forecast to bring periodic chances for rain from Friday night through Monday.